In his heyday of the late seventies and early eighties, visually he looked like and was occasionally mistaken for Bruce Forsyth, these days you might mistake him for Rob Brydon. The connection must the long face and the prominent chin. Who? B. 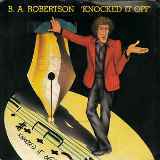 A. Robertson. A fine songwriter who can cram as many words into a song as Jim Steinman. His name was first seen in the UK chart in 1979 with his debut single Bang Bang, but he’d been around long before that. B.A. (Brian Alexander) was born in Glasgow in September 1956 and learned piano as a teenager. He recorded his first album Wringing Applause in 1973 and because of his quirky and witty lyrics it received critical acclaim. If you check out the B side of Steve Harley and the Cockney Rebel’s 1975 number one, Make Me Smile (Come Up and See Me) you’ll hear B.A playing piano on the track Another Journey. Later that year he embarked on the occasional tour and in 1977 was the opening act on Van Der Graaf Generator’s farewell tour. He put his own band together to promote the album Shadow Of A Thin Man, the band comprised guitarist Terry Britten, with whom B.A would form a long-term writing partnership, George Fenton, who later went on to compose many TV theme tunes and film scores, keyboard player Tony Hymas who later joined Ph.D with Jim Diamond and percussion player Frank Ricotti who became an in-demand session player for people like Tina Turner, Status Quo, Pet Shop Boys and Belle And Sebastian among others. Bang Bang was his first UK hit which reached number two with a playful look at historical figures and their love lives, the follow-up, three months later was Knocked It Off another song with wacky lyrics explaining all the things that B.A could, wanted and was willing to do. Those two songs, and the third hit, Kool in the Kaftan, were all taken from the album Initial Success which spent a couple of months on the chart in 1980. He spent a lot of time writing songs for other people and his first successes came with Cliff Richard’s hits Hot Shot, Carrie and Wired for Sound. In 1981 he wrote the theme to Noel Edmunds’ Multi-Coloured Swap Shop show and then co-wrote and provided backing vocals for its spin-off hit I Wanna Be a Winner credited as Brown Sauce. The following year he penned the lyrics to the Scottish World Cup Squad’s number five hit We Have a Dream. During the eighties he wrote and produced songs with Joe Brown, Chris Spedding, Harry Nilsson, Sandie Shaw, Micky Dolenz and Lionel Bart. He also worked extensively with session bass player and songwriter Herbie Flowers. He was briefly given his own BBC chat show, but his interviews technique and questions were a bit odd, to say the least. He was given his own music series called B.A In Music with guests that included Ray Charles and Jack Bruce and the last ever TV interview with Alex Harvey just before he died in February 1982. The following year he got into acting and starred in the film Living Apart Together which was about a singer/songwriter returning to his hometown of Glasgow after a US tour and tries to save his marriage which was failing whilst he was away. Later the same year he starred, opposite Elaine Paige on the London Stage in the show Abbacadabra. He continued songwriting and in 1986 he teamed up with Mike Rutherford who had just formed Mike and the Mechanics and co-wrote five of their hits including their biggest success The Living Years. Mike said of the song, “B.A. lost his dad and it’s about the lack of communication between him and his father before he died. There’s also the irony of him having a baby just after losing his father. I had exactly the same thing happen to me at the same time, so it meant a lot to me too.” The song was nominated for four Grammy Awards but lost out on Song of the Year to The Wind Beneath My Wings. It did, however, win Best Song at the Ivor Novello Awards in London. In the nineties he worked with Dave Edmunds, Roger Daltrey, Lonnie Donegan and Duran Duran’s Andy Taylor. In 1996 he moved to Ireland where he composed the score for the movie Bloodlines (Legacy of a Lord). Two years later he wrote and produced Across The Bridge Of Hope – the title track of the Omagh tribute album which helped to raise over half a million dollars for the victims of the Omagh bombing. He had long given up performing live, but in 2004 the New York producer Arnold Engelman encouraged him to return to live performance. He did a one-man show for 10 consecutive nights at the Edinburgh Festival which led to some small tours of Scotland and Ireland.